Three examples of Dearborn's street-rod pickup are coming up for auction in Houston. 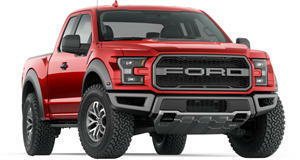 The Ford F-150 Raptor is one heck of a truck. But if you miss the days when pickups were transformed into road-focused hot rods instead of dune-jumping off-roaders, Mecum's upcoming auction in Houston could be just the place for you. That's where three evidently pristine examples of the Ford F-150 SVT Lightning are coming up for auction, each in a different color: red, black, and blue. And from the look of it, they would appear to all have come from the collection of one very dedicated fan of a breed long since gone from showrooms. Ford's Special Vehicle Team produced two iterations of the Lightning: one based on the ninth-generation F-Series between 1993 and 1995, and another based on the jellybean-shaped tenth-gen truck from 1999 through 2004. These are from the latter, packing a 5.4-liter supercharged V8, mated to a four-speed automatic driving the rear wheels. These being 2002 (red) and 2003 (black and blue) models, they feature the upgraded engine, massaged from the original 360 horsepower and 440 lb-ft of torque to 380 hp and 450 lb-ft. That much muscle made the final Lightning more potent than the first iteration of the Raptor. Essentially taking the Lightning's place, the original Ford F-150 SVT Raptor packed a 5.4-liter atmospheric V8 kicking out 310 hp and 365 lb-ft. With 411 hp, the optional 6.2-liter version packed more power, but still less torque at 434 lb-ft. It took another few years before the current Raptor, with its 3.5-liter twin-turbo V6, surpassed both figures at 450 hp and 510 lb-ft. Still, the Lightning holds a special place in the hearts of a certain type of enthusiast. And if you're one of them, you'll want to bring your checkbook to the NRG Center in Houston come April 4-6.